Home / News / Shock as TUJU buries RUTO’s hope of becoming President in 2022-See what he said that left the DP scratching his head? 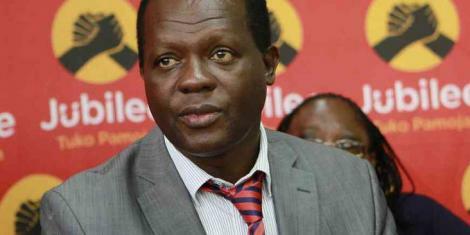 Shock as TUJU buries RUTO’s hope of becoming President in 2022-See what he said that left the DP scratching his head? Wednesday April 17, 2019-Deputy President William Ruto’s hopes of becoming President in 2022 are dwindling by the day at least going by the statement of Jubilee Party Secretary General, Raphael Tuju. Speaking yesterday during an interview on Citizen TV, Tuju noted that it is not a must that Ruto should become President in 2022. He said that Ruto will be treated like any other aspirant for the Jubilee Party Presidential ticket come 2022 and therefore should not expect any favours at all. “Ruto will be subjected to a nomination exercise before being handed the party Presidential ticket, if he wins,” said Tuju. The Cabinet Secretary without portfolio further noted that the DP is well aware of the party constitutional requirement, and has already accepted that he will take the challenge. "He has stated that he will follow the party Constitution which states very clearly how we come to decide who will be the party candidate and has gracefully accepted that he will allow himself to be subjected to that party democratic process," said Tuju.